Fancy Napkin: .st. 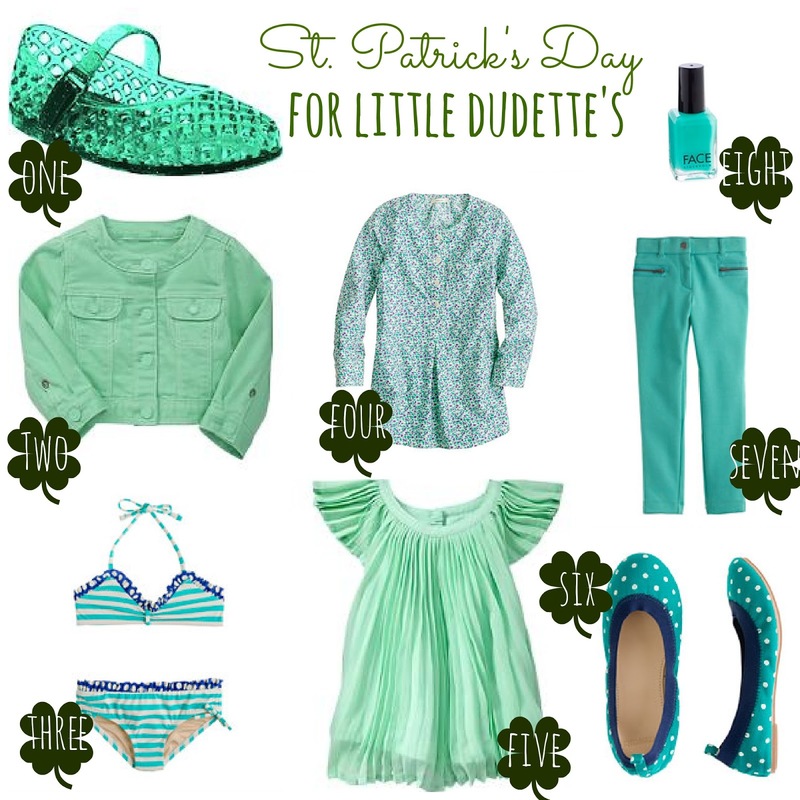 patrick's day dud's, for the kiddos. sure, st. patrick's day is only 2 days away, so perhaps it may be a little late to order some of these sweet dud's for your little kiddo's [hey! theirs always express shipping!!] but i couldn't help but fall in love with some of these lovely green pieces and needed to share. i mean green jelly shoes! yes, please!! and as the old tradition goes, if you're not wearing green on march 17th those pesky little leprechauns may sneak up and give you a hard little pinch!! and i just hate being pinched [just another great excuse to go shopping! ], so wear your green! one || green jelly shoes, oh-my-gosh-awesome! i lived in my jelly shoes growing up and i was so happy to see them popping up here and there this season. wonder if i could still pull them off now, at 30? two || a mint green jean jacket...basically a style staple your little girl needs in her closet this season. three || so it's a little cold out for bathing suits [unless perhaps you live in texas] but this was just the cutest little suit i've seen. and while the green suits the st. patty's style i have going on here, their's some damn great other colors available as well! four || such a beautiful shirt. i can just see this with a little braided belt, leggings and gold sandals for the perfect spring outfit. five || although at first glance this looks like a cute dress, it is in fact a cute flowy top. i think this would be so cute with a pair of capri floral jeans or some floral leggings. add a scarf and it's perfection! six || i'd buy these shoes is a ladies size 7.5 if i could. super super adorable. seven || a little pixie pant! super adorable styled with ballet flats, but would also be great with some converse sneakers for a different look! eight || a safe nail polish for little ones and perfectly names sweet pea. one || this shirt could basically could go with anything. 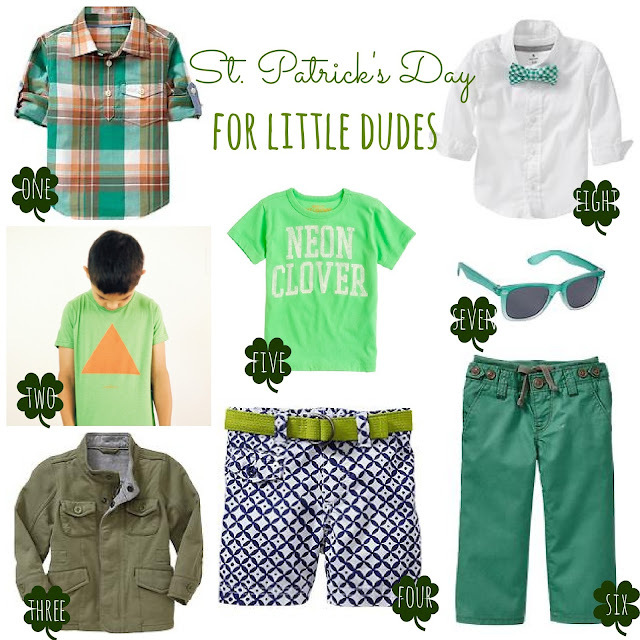 a versatile plaid shirt that your little dude wouldn't just need to wear on st. patty's day. two || just the coolest little persons tee, which would layer so well. three || this sweet little sweater jacket it warm enough for the still cool days, but soft and light enough for the upcoming warmer days. a perfect combo! four || aren't these awesome shorts the funkiest? loving the navy and green mix of colors too! five || this is probably the most perfect tee for a little boy this st. patty's day. and it's neon!? bonus! want another bonus? it's on sale!! six || i just loved the shade of green on these pants. simple as that. seven || green mini raybans? yes, please! eight || probably my favourite look ever. a little boy in a bow tie? oh ya. completely ador-a-ble!